Big football players usually roam a university’s gridiron on Saturday afternoons. But construction crews recently found the remains of some much larger—and mostly extinct—creatures while working on a field’s end zone. 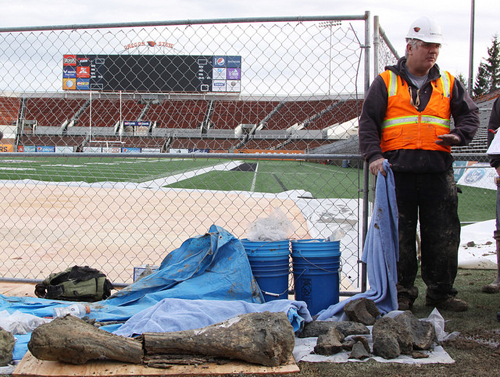 Crews digging in the north end zone at Oregon State University’s Reser Stadium uncovered a large femur bone, likely from a mammoth, according to a university statement released Jan. 26. As they dug deeper, they found more bones from several extinct mammals. 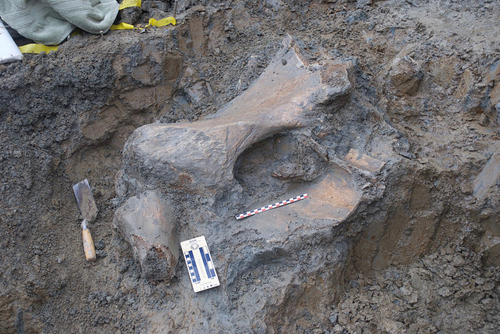 OSU anthropologist Loren Davis was on site near Reser Stadium after mammoth bones were found during construction at the university's football field. 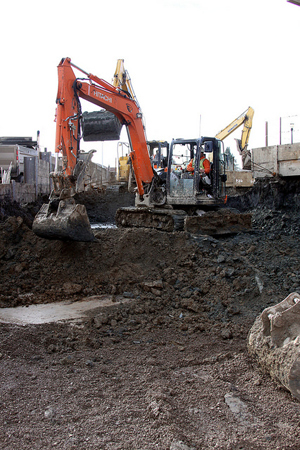 The crews were digging as part of the ongoing Valley Football Center expansion and renovation project. Work began after the fall football season and is planned for completion by the start of the 2016 home opener. Discovery of ancient mammal bones is not unusual in the Willamette Valley, where the university calls home, Davis said. 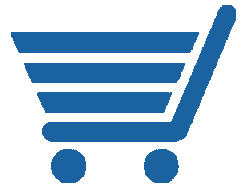 The bones, including mammoth, bison and some kind of camel or horse, were discovered in a 10-foot deep plot in an area that may have been a bog or marsh in ancient times, Davis said. Workers from Hunt-Fortis Construction Inc. work on the expansion of Valley Football Center at Oregon State University. Davis also said no human bones were found among the remains. He also said the animals do not believe to have been killed, but rather died a natural death. 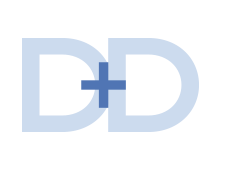 A worker from Hunt/Fortis, the joint venture general contractor working on the project, made the initial discovery of a large femur bone and stopped work in the area, said Tim Sissel, senior project manager for the construction project. 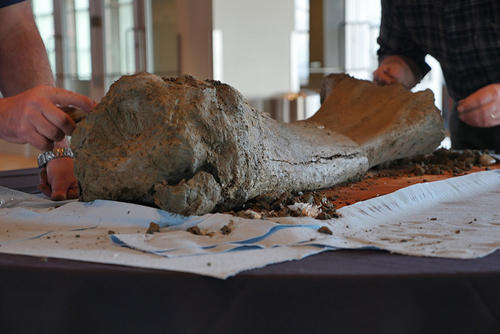 A mammoth femur found on a construction site at Oregon State University is examined during a press conference. Company officials notified OSU officials, who brought in Davis and other experts. Crews have moved to other areas of the project while Davis and others take a closer look at the find. The delay has been minimal so far, Sissel said. In Oregon, there are no special rules or regulations governing the preservation or protection of paleontology finds, Davis said in the statement. After construction workers discovered mammoth bones and other ancient animal bones on site at Oregon State University's Valley Football Center, a team stepped in to remove some of the bones. Meanwhile, Davis said he plans to soak the bones in water to prevent further deterioration. He also said he hopes to send some out for carbon dating while he and students continue to dig.